What is a dementia friend and what does that mean? Dementia Friends is an Alzheimer’s Society initiative that was set up in 2012 which aims to give people a better understanding of dementia. There are currently just over 2 million dementia friends in England and Wales and the aim is to double this in the next few years. To become a Dementia Friend, you will attend a 45 minute, free session which looks at various interactive activities that explain more about dementia and how everyone can help to create dementia friendly communities. At the end of the session, individuals are encouraged to undertake a simple action of support, which may be wearing their dementia friends badge or telling their friends to encourage them to attend a session. Why do we encourage all our staff to be Dementia Friends? 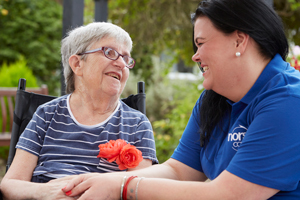 In all of our homes we have individuals living with dementia and our care staff are highly trained in providing the best care possible for their needs. All care staff are encouraged to become a Dementia Friend upon joining the company. In all of our homes and schemes, we have Dementia Champions who have had further training to provide the Dementia Friends sessions to friends, family and within their local community. 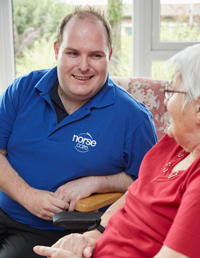 Norsecare are highly involved in their local communities and feel that their staff can play a big role in ‘spreading the word’ on dementia, using our knowledge and experience to support and develop dementia friendly communities. We also deliver Dementia Friends training to staff across the whole of the Norse Group, ensuring we a proactive, Dementia Friendly organisation.